Crawfish is a band that "just wants to have fun and make its audiences feel good." Perfect for The Great Revel Reunion! 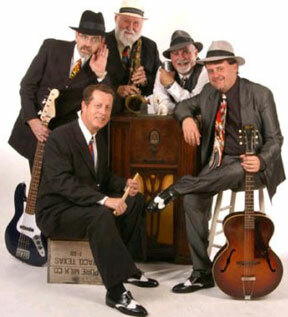 Incorporating every imaginable musical style - Dixieland, polka, Creole, classic rock and roll, contemporary jazz, country, Cajun Zydeco and rhythm-and-blues - this band's performances include a great deal of family-oriented audience participation, music that appeals to all ages, and unbeatable fun! You may need realplayer to listen to the demo. "They played great! Many people have commented at how good they were!" "Our guests were raving about Crawfish - what an amazing band! Perfect". "They were great! They had already been there and were performing when we arrived, which was perfect since guests were there already." "Crawfish was a fun band to entertain our customers. They were literally dancing in the hallway and getting wild while enjoying Crawfish"
"What a great time with real musicians - we had a ball!" "In addition to their great sound, they were completely professional. Everyone enjoyed their wide variety of music styles and their ability to interact with their guests. They made our party a great success." "I wanted to take a moment to express how happy and satisfied North Dallas Bank & Trust has been with Crawfish's performance at our annual Holiday Parties. North Dallas Bank & Trust has had the pleasure of having Crawfish play at our annual Holiday Party for the past seven years. They are truly a class act, which have made our parties a success with the bank employees and guests. They perform a great variety of music and can really read our group to get them dancing. Over the past years the first comment from our employees is, can we book them again next year.A sincere thanks to Ron, Crawfish and Carol Marks Music for showing the professionalism and interest in all our parties. We look forward to many more great parties."